i am delighted to report dearest readers, because of your brilliantly brilliant recall skills the other day, i have over 46 'dottie angel' words scribbled on a piece of paper sitting in my 'terribly important' note making pile! i typed my scribbled words into 'Word' and it all became too much for poor old Mr Spell Checker which delighted me greatly. not that i delight in Mr Spell Checker having a funny turn, far from it, i need him more than he will ever know, for spelling has never been my forte and i rely upon him and his wisdom at all times. my delight came from so many words not being recognized as real words and i wondered just how many other undiscovered words there must be floating around in our little brains waiting to be put to good use in everyday conversations. this pondering led to some thinking, and that thinking led to a thought worthy of taking action on. and then it all came back to me, how i would drive the folks around me potty when i was younger, as i attempted to introduce my 'word of the week' into every sentence i spoke. i think this would be a grand way to pass the winter months and expand our daily vocab. bearing my new shiny year resolutions in mind i found a new friend, being of the green variety, if i manage to keep him alive, i will have 'keep a plant alive' covered on my resolution list as well. it took me a little while to track him down for cheese plants are a rare breed these days, i am a little fearful if i keep him alive he will grow to 'mammoth cheese plant' proportions but for now he fits nicely inside our biscuit jar and so far, 9 days on from bringing his little green self home to the shed, i am relieved to see he is still looking like a cheese plant, albeit quite snug in his jar. 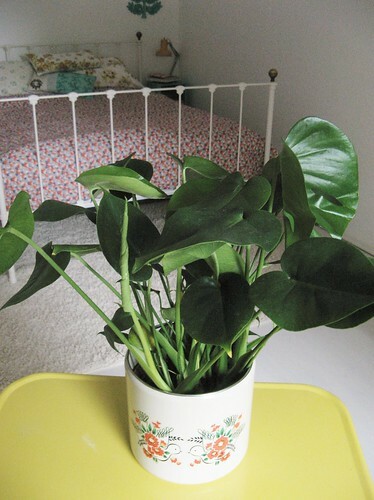 "to make a difference to the air we breath within our homes we need to have 20 houseplants or more". "good morning plants, how are we today?" would not cut it, no sirree, they would all like a bit of individual quality time and who can blame them. i would have to remember all 20 names and i am quite sure they would know if i made a mistake, although i am also quite sure they would be too polite to voice my mistake. by the time i had spoken individual words of encouragement to each and every little green friend in the shed, it would be time for bed and then we would have to start all over again the next morning. this one is a little shocking, i am trying to maintain 'high hopes' it is just a blip in my cooking abilities and one that will pass quickly. i have not cooked a proper full on orange meal in over a month, when this thought dawned on me last week i felt a grip of mild panic. what will i do if i cannot cook my trademark orange meal. i calmed myself down with some chocolate i located from my hidden stash in the studio, i told myself to recall my most glorious orange meal moments and that is when panic gripped me again. will have to wait! ha ha hee hee! for i have rambled enough today and i must take my ramblings over to 'Word' and continue what i started rambling yesterday, filed neatly within my very 'neatest as neat can be' filing system, deep in the depths of Colin the computer's brain. What potent notables my dear! I would like a "word of the week" very much, as I like words, yours especially. mr. cheesy seems to be taking his new post in stride, looking dapper besides. As to orange meals, I have absolute faith in you. Nary a doubt in my mind that your children's children will know the wonder of your monochromatic masterpieces! oh, thank you! So much happiness, so many smiles. I love Mr. C. Your plant conversations positively crack me up. Whilst the jar Mr. Cheesy is residing is a perfect home, I am wondering if, should he survive the dottie treatment, that he be treated to a colourful crochet jacket? Then his competition success would indeed be "stitched on". Only a dozen plants in our home but the delectably delicious smell of blue hyacinths makes up for the missing 8! Spider plants are supposed to be the very best for your homely air and you could practice your planty caring skills on their many babies. Yes, a word of the week is indeedy an excellent plan. I think you are very wise to begin with the single plant, rather than taking on too many at one time. I took care of a friend's plants for the past 7 months (it was originally supposed to be 3 months but his travels took longer than expected) and I breathed a huge sigh of relief earlier this week, when he came to pick them up. I gave them all special attention at first, but it became too overwhelming after awhile and I just couldn't keep up with it. Two of them started to lose leaves and I felt sad and guilty for being too busy. Now that I only have my own 7 plants to keep alive, it is so much more relaxed around here. I love the High Hopes piece! It is really gorgeous AND it may well keep you on track!! Oh my goodness Tif..... I haven't seen (or heard of ) a cheese plant in ....well, years! Where on earth did you find him? Looking forward to note #4. Grrr . . . just when I'm breathless with excitement for Note #4, you go and leave me hanging! Looking forward to more ramblings, as always. I can quite imagine Mr Cheesy letting out a sigh of relief at your trying to keep him alive, but I'm sure he's in safe hands. I hope he's up to the job of cleaning the air! Bless him. My goal is to just have one plant per room to help with indoor air. I have a huge spider plant that I am making baby plants out of. Easy to grow too. Love your posts! Tif you absolutely must get a spider plant. You can treat them badly and they survive and they also have babies. The said babies can be shoved into pots and guess what you can be unkind to them and they will grow and have babies too so soon your mossy shed would be filled with 20 easy to look after lovelies in no time. You could also name them with spidery names like Miss Muffett, Incy Wincy, Widow, Tranchy, Daddy Long Legs - Oh the possibilities are endless. Do you think Mr Custom man would mind if I posted you some - i'm quite sure they would survive. Maybe youmcan play some plant blogs for cheesey the plsnt to listen to . Funny..so what was the word of the week? I make a mean yellow dinner! I thought I was alone in the single coloured mealtime.. thank heavens! Re Mr C Plant, my master wanted me to tell you that he is sure you'll do it, i.e. keep it alive. However Mr C will struggle to clear the air. My master has 100 orchids and several other pot plants dotted around the house and he says I still wheeze like an old grampus. I tell him that it's not wheezing but tinnitus, just like him. He's not convinced but he's stopped thinking of changing me in for someone called Mike the Mac just yet. happy weekend my dears and CTC, i'm not allowed to say the MAC word remember! Just to say, Mr C. looks wonderful, but already slightly... 'mature.' (Not wishing to hurt his feelings). You might need to put him in a slightly bigger pot sooner than you think. I think the 20 plant problem is really funny for someone who once dreamed about 8 children! If you had them, though, they could help you water and talk to your 20 plants! Love your notes and definitely think they're all worth noting.